We picked up where we left off this week – with mayhem breaking out. Kurtis shot the summoned snake from his vantage point in the shadows at the top of the stairs, leaving Bumperklart free to bound across the platform to engage the troglodyte cleric. The creature seemed to be directing the other cultists, so stopping this more formidable foe would hopefully prevent more potent magics from being unleashed. 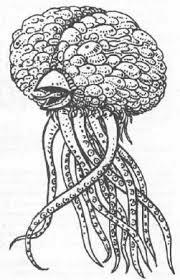 The rest of the adventurers, who had hung back so that they wouldn’t be affected by the Word of Chaos, closed in, only to be confronted by a slender creature in dark armour whose head appeared to be that of a squid. Moments later, their brains were lashed by horrendous and confusing images, thoughts and alien concepts that threatened to overwhelm them. Keil was stunned, but the warforged kept coming, forcing the creature to disappear seemingly into thin air to avoid them. Wary of the strange creature, the party was divided between defeating the cultists and watching out for its return. Area effect spells cast at its last location didn’t seem to cause a reaction. The human cultists were quickly cut down, though the lizard-like leader was made of sterner stuff. Keil quickly shook off the effects of the mindblast, just as the creature stepped out of thin air nearer him, Daria and Spugnoir. 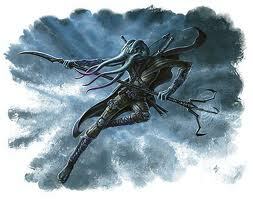 They shrugged off another mindblast – all except Spugnoir – who was quickly grappled by the mindflayer and dragged back into the corridor. The race was on to save Spugnoir before the Shadowflayer could consume his brain. Attempts to grapple him by Ruin were deflected by the surprisingly dextrous and strong creature, while attempts to stab it by the others were not effective. In the end, after much agonising, Daria was able to work out how to access the power of a magical scroll the group had picked up in their journeys, and she launched a powerful fireball spell, pitched to land behind it. It was enough damage, just in time, to kill the flayer and rescue Spugnoir. As silence fell, the debate began about whether to explore further. The statue that had just been retrieved was making their eyes hurt as it was triangular, but seemed to have four sides when they investigated it. Old lore and some guesswork linked it back to the old elemental cult, but reflective of seasons in some other plane – possibly that of Xoriat, the plane of madness. A descent into the old pool began, lowering them past the original plug and the water channels that had fed the pool and down into a huge cavern below. As they lowered themselves down, a strange brainlike creature with writhing tentacles attempted to carry off Kurtis, but it was quickly shot down by the party and other than deeply disturbing them with its appearance it seemed to pose no great threat. A large convex surface of what appeared to be marble was below, with a gap around it that suggested further depths. Worse, it was supernaturally cold, and they began to suffer from hypothermia the longer they were down there. Strange veins in the marble seemed to writhe and reach for them as they got there, so they quickly ran to another platform near the edge, not wanting to risk contact with them, and then they lowered themselves another three or four hundred feet to the cavern floor below. The stone was revealed to be a huge inverted obelisk, balance on a needle tipped column below, and more disturbing carvings could be found on the floor beside them. These two carvings – one an inverted pyramid similar to a symbol found on the troglodyte, and the other a black sun – were carefully avoided, just as a shrieking madman wrapped in winter blankets appeared, summoning two small demonic beings to attack them. Madrigal dispatched the demons, barely breaking his stride, and the madman was swiftly silenced. With mind-numbing cold pressing in on them, and a cavern to explore, we left the game there.